In certain enclaves around Boston, parenting is already a competitive sport. But the standards are getting even higher. A number of mothers and fathers are piling two, three, even four kids on a single bike, dropping off the older ones at school, pedaling the younger ones to day care, and then riding to the office, ready to start their day. 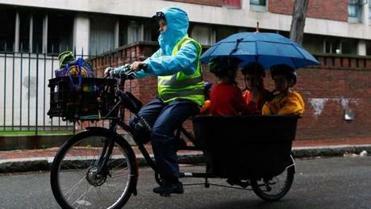 Called cargo bikes, the pedal-powered behemoths may become the new minivan. And with prices that can surpass $4,000, they cost as much as bikes typically pedaled by a rider wearing spandex, not mom jeans. “My primary goal was fitting in exercise,” said Katie Starbuck, a mother of four who lives in Cambridge and works in Somerville, and does own a car. But after more than a year of buckling her brood into one of the family’s two cargo bikes, she’s discovered the true beauty of family biking: back seat peace among her kids. All-aboard, open-air commuting is not for most parents. It is certainly not for the traffic-fearing. Nor is it for those who don’t want their children exposed to rain or cold — even if they hold an umbrella or wear a ski helmet and goggles for warmth during the winter. And with some bikes stretching 7½ feet, and weighing up to 85 pounds before the kids climb in, it’s certainly not for the lazy. Interest in piling the clan onto one bike has grown to the point where a boutique Somerville bike shop is holding a family biking workshop, and the father who cofounded a Boston-area family biking Google group says he no longer knows everyone in the community. In many suburbs a person could go a lifetime without spotting a family bike. But in parts of Cambridge, Somerville, Arlington, and Jamaica Plain, parents can be seen pedaling their kids around in front- or rear-mounted, harness-equipped tubs, or on multiple bike seats, or they’re being trailed on an attached bike. With prices that can hit $2,000, $3,000, $4,000, or more if you toss in an electric assist motor to help with hills or a foul-weather cover, the bikes are not cheap — unless they are functioning as the family car, said Todd Consentino, a cargo-bike-riding father of three from Belmont, and author of a biking in Boston with kids blog. In Cambridge, Jeffrey Rosenblum, cofounder of the LivableStreets Alliance, and a transportation planner for the city, says traveling by bike helps his two children feel more connected to the world around them — and him to them. Statistics about the dangers of biking with children are hard to find. No health or safety agency has information broken down that way. But observers say they can’t recall a serious accident locally, and they emphasize that parents riding with kids typically avoid high-traffic routes and ride in a generally more cautious way. The City of Cambridge is conducting an assessment of bike crash reports from 2004 to 2012, and not only is the overall crash rate dropping, but none of the accidents involved kids in bike seats or trailers, according to the city’s principal traffic engineer, Jeff Parenti. In Boston, a 2013 crash safety report also indicates the bike crash injury rate may be dropping, but the director of the city’s Boston Bikes program, Nicole Freedman, said more years of data are required to come to any conclusions. The study did not look at children specifically. Earlier this year, a report by the nonprofit Alliance for Biking & Walking, ranked Boston the 12th-safest biking city, based on federal fatality and commuting data (with an average of 1.3 bicyclist fatalities per year). On a recent Saturday, at the newly opened Bicycle Belle shop in Somerville, another parent was trying out a family bike. “Be careful, you’re very wide in the back,” proprietor Carice Reddien said as Marissa Swinghammer, a Jamaica Plain artist with two kids, maneuvered a $2,049 Xtracycle “longtail” cargo bike out the door, mindful not to bump the kiddie guard rail and foot rest installed behind the driver’s seat. No, as it turned out. Daunted by the difficulty of mounting the bike, and the prospect of schlepping the 65-pound vehicle up four steps to a storage area, Swinghammer turned her attention — at least momentarily — to regular single-seat bikes. But with the nation in a bike swoon, cargo biking has spawned its own Kickstarter-funded documentary — “Less Car More Go ” — and a celebrity. She’s Emily Finch, and she’s become famous for riding around Portland, Ore., with five children on her bike, and the sixth trailing in an attached bike. Beth Teitell can be reached at beth.teitell@globe.com.